Not everybody loves Rachel Berry. She’s something of a divisive character based on a few of her personality traits, and many people would agree that if they knew Rachel in real life they probably wouldn’t like her. But, plenty remain fans, and maintain that if there were a Rachel Berry in their school, they’d be best friends. There’s a reason why the reaction to Rachel is so strong and contradictory. Rachel has displayed traits that are in direct conflict with one another, and can be argued with equal conviction. She is both selfish and selfless, self-confident and insecure, bossy and submissive. Whether or not you like her depends on what traits you’re taking into consideration when evaluating the character. But perhaps a more worthwhile use of time would be to analyze what creates that dichotomy in character. When is Rachel selfish, when is she selfless, and what about the situations leads to the different results? What does this say about her character - and is that a reason to dislike her? To be fair, the dualities in Rachel’s character and the way she is wielded in the show help to round her out as one of the more successful characters that the show has created and furthered. She’s complex, with real flaws and real strengths, and it helps support her as the tragicomic lead. However, this also creates issues with how she is developed in conjunction with her peers, and in nurturing her character arc for the purpose of the show. Perhaps the biggest thing about Rachel Berry that gets overlooked is the idea that sometimes she is incredibly selfish and sometimes she is incredibly selfless. And it all boils down to the idea that Rachel as a character is trying to move herself out of isolation. She’s reached out repeatedly, to Finn, to Quinn, to Kurt - to people who have ignored her at best and tortured her at worst, in an effort to strike up a friendship. Rachel Berry wants to be loved. She wants to have friends. She wants to be a valued part of the Glee Club. But based on the way people treat her, she is under the assumption that the best way to win people over is to sing. In the Pilot, she tells Will that the only way for people not to hate her is to be great at something. What is Rachel Berry good at? Singing. The very next episode, Finn tells Rachel that he thinks she talks too much and that her obsessiveness unsettles him, but that when she sings, it changes everything. Puck says early on that Rachel makes him want to light himself on fire, but man, can she sing. It’s been drilled into Rachel’s head, repeatedly, that the only thing she has to offer is her singing voice. So she holds onto that identity, and protects that role so she has something to offer. 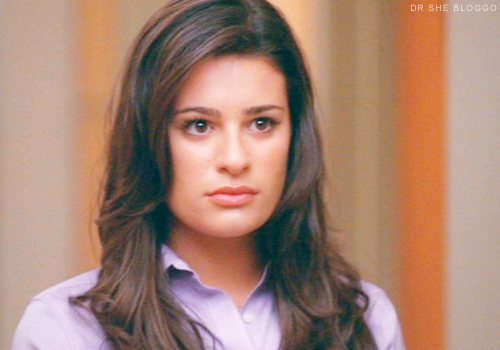 She knows she can’t always have a solo - Will tells her that in “Showmance.” And frankly, that’s part of Rachel’s arc. If she’s going to become a functional part of the Glee club, she needs to be a team player. But where the writers went wrong was in the payoff of that idea. Rachel gave up a solo to Mercedes in “Sectionals,” and it took a whole season thereafter for Rachel to be rewarded, in terms of storytelling, with friends. She’s displayed team-oriented behavior as early as the F13. But of course, it doesn’t help that there’s been some backtracking. Rachel’s likeability always takes a hit when we don’t understand her, as I mentioned in the previous entry, and often it’s a result of the writers mishandling the dichotomies Rachel’s character. Back to “Audition” for an example - the idea that Rachel was threatened by Sunshine was not unfounded, but the writers were slightly left of target in the reasoning. It’s not that Sunshine was threatening Rachel’s solos. She was threatening her position as soloist - because the only place where Rachel is appreciated is on stage, singing into that microphone. Sunshine inadvertently compromised the only likeable identity that Rachel ever had to offer anyone, and Rachel acted out. But instead of focusing on the fact that that’s actually rather depressing, the writers chose instead to view Rachel two-dimensionally, and had her simply throw a tantrum over the loss of solos. This issue of poor writing choice arose again in “Duets.” Rachel expressed that felt she wasn’t as good a person as Finn and was inspired to be more like him as a result. This led to her reaching out to both Quinn and Kurt, throwing the competition and extending a hand in friendship - all good outcomes, yes. But the writers really missed the point there. The point of Rachel’s arc is not to have her be “more like Finn.” It’s to include her in the Glee club, and give her friends and acceptance as a result. She inherently wants to reach out and be kind, based on the notion that it might beget her a friendship. It has nothing to do with Finn, so the way Rachel’s actions played out in that particular instance were a bit misguided, unfortunately. We, as an audience, bear witness to Rachel Berry being kind and compassionate, and yet it gets overlooked by the other characters within the narrative. Rachel has never been just a singing voice to the audience. We’ve seen her cry far too many times to write her off as completely insensitive. Alas, the other characters haven’t. Rachel cries behind closed doors, where only we can see her. There is a difference between the way the characters on the show see Rachel, and the way we, as an audience, are meant to see Rachel. And unfortunately, at many times in Season 2, it's as if the writers are treating Rachel as though they actually attend McKinley High. Writing Rachel Berry calls for a delicate balance of opposites, and an understanding of when those characteristics arise and lay dormant. She is embedded in the narrative, and also a construct of it; she is vulnerable, and yet self-confident; she embodies what the Glee Club represents, but she isn’t truly a part of it. Rachel is defined by a series of polarities, which causes both dynamism and contradiction in the way the character is portrayed onscreen. When the writers mishandle this balance, we find ourselves trying to negotiate the likeability in a character who is disproportionately hyperbolic and empathetic. Ok so this is everything that I have been feeling for a while. Thank you for writing it down. My whole problem with Rachel in season one is that she just seemed everywhere for me; she is nice she is selfish, she cares she is annoying,she is singing, she is smiling,she is crying. She is so many contradictions that are forced to fit leaving her in the love/hate pile. It does not help that the writing is never consistent. Then season 2 came and I officially had little patience for her. Her need to please Finn (that is how I interpreted it) was desperate, and that is not cute. She seems to be doing better now, but I am just apprehensive about this whole Quinn/Finn/Rachel storyline. We know how it ends of course, but God forbid, someone in all of this will be seen in a bad light, and since Finn is nothing but a puppet at the moment, Quinn and Rachel will most likely suffer. With all the eye-rolling at the character regression and inconsistencies and at RIB, I sometimes forget that there are so many kids (and adults) watching who can be moved to such an extent by Glee. And again, I'm so glad at how the last episode ended. The whole second half, really. Rachel tries. So, so hard. Stupid "Audition". cxxl - Thanks for the comment! I too am frustrated with Rachel's interactions with Finn, and the writers not being able to write consistently for her. This is a great series so far. Rachel is one of my favorite characters on the show. It's frustrating that she's so often misunderstood by both the other characters and by a large part of the "Glee" fanbase. So, thank you for your insights into her character. The ending of "Original Song" was so gratifying for reasons you've brought up here and in Part 2. This is a great culmination of the progress that Rachel has made. Will's and the Glee Club's methods in getting Rachel to become a team player have been brutal, but the payoff was that incredible acceptance speech and group hug. It made the long, rocky journey worth it. During her speech, there was a reaction shot of Will in which he finally seemed to understand just how much Rachel needed someone to believe in her and support her. I'm hoping the general glee amnesia doesn't set in with Will. Will you be tackling the prickly relationship between Will and Rachel in this series? Thanks so much! Rachel is definitely misunderstood, which is unfortunate considering she's the show's main character. Actually, I don't have anything planned for Will in the series, but I definitely find his and Rachel's dynamic fascinating. I think he originally believed in and supported Rachel in the F13 but S2 has him doubling back on that. He's treated Rachel a bit harshly in S2, which is unfair to both characters. I loved the idea that Will was Rachel's biggest fan, and that as a student he treated her gently. And I loved that Will would get bad ideas and Rachel would call him out on them and she would always be right, haha. It was a great student-teacher dynamic that I would love to come back on my screen. Thanks for reading, and the comment! Please forgive my ignorance. Can you please explain what RIB is? I see it in the comment near the top and all over Facebook. And may I say, I am really amazed by all the conversation going on about Glee. Very cool.